Metropolitan Hilarion of Volokolamsk, chairman of the Moscow Patriarchate’s Department for External Church Relations, currently on a visit to the People’s Republic of China at the invitation of the State Administration for Religious Affairs, visited the National Catholic Seminary in Beijing. On 20 June 1012, Metropolitan Hilarion of Volokolamsk, chairman of the Moscow Patriarchate’s Department for External Church Relations, currently on a visit to the People’s Republic of China at the invitation of the State Administration for Religious Affairs, visited the National Catholic Seminary in Beijing. Metropolitan Hilarion and his suite were met at the entrance by Bishop Joseph Ma Yinglin, who is chairman of the Chinese Catholic Bishops’ Conference, vice-chairman of the Chinese Catholic Patriotic Association and rector of the Beijing’s Catholic Seminary, which opened in 1983. After seeing the seminary’s church, which resembles the symbol of Beijing, Metropolitan Hilarion met with the faculty and students. Bishop Joseph greeted the guests and shared with them his warm recollection of his visit to Russian in 2006, during which he met with Patriarch Alexy II and Metropolitan Kirill of Smolensk and Kaliningrad, now Patriarch of Moscow and All Russia. He told the guests about the present situation of Catholicism in China and about the Seminary and asked Metropolitan Hilarion to convey his gratitude and best wishes to Patriarch Kirill along with an invitation to visit the National Catholic Seminary and meet with the Chinese Catholics. Metropolitan Hilarion thanked Bishop Joseph for the invitation to visit his seminary and told those present about the history of the Orthodox Church, its life at present and its administrative structure. He spoke in detail about the history of the Russian Orthodox Church and the Chinese Autonomous Orthodox Church. 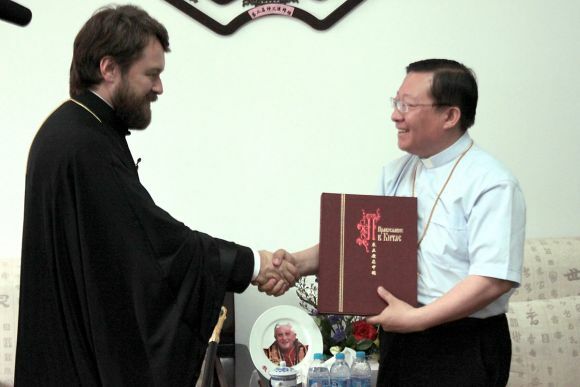 Metropolitan Hilarion noted a possible cooperation between the National Catholic Seminary in Beijing and the theological schools of the Moscow Patriarchate, expressed his hope for the Chinese Autonomous Orthodox Church to occupy a proper place among religious confessions of China, and presented the seminary’s library with a book “Orthodoxy in China’ published in Russian and Chinese by the Moscow Patriarchate’s Department for External Church Relations and the Institute of Far Eastern Studies of the Russian Academy of Sciences. Bishop Joseph gave a luncheon in honour of Metropolitan Hilarion and the Russian delegation.